Injectable Solution: Vial of lyophilized powder + Ampoules of solvent of 3 ml: Box of 6. Each vial of lyophilized powder contains: Pridinol mesylate: 2.20 mg. Excipients: mannitol: 67.80 mg.
Each ampoule of solvent contains: Sodium Diclofenac: 75 mg. Excipients: mannitol: 18 mg, propylenglycol: 800 mg; benzyl alcohol: 120 mg, sodium metabisulfite: 9 mg, sodium hydroxide q.s. pH 8,6; water for injection q.s. 3 ml. Diclofenac is a NSAI drug acting through the inhibition of prostaglandin synthesis. Pridinol is a central-action muscular relaxant which is effective in the muscular spasm. 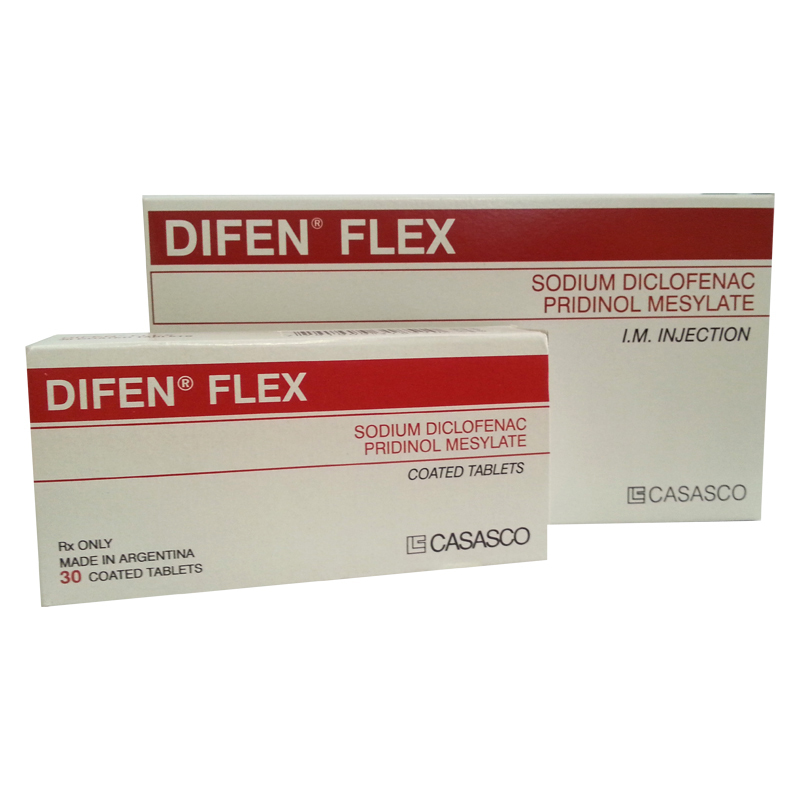 Difen Flex is indicated in painful inflammatory processes with muscular contracture. Articular and extra-articular rheumatic processes, myalgias, lumbar pains, ciatagias, torticollis, traumas, sprains. History of allergy to any of the product components. Active gastrointestinal ulcer. Severe liver and/or renal failure. Patients with history of asthma, rhinitis or urticaria triggered by acetylsalicylic acid or other NSAI drugs. Pregnancy and nursing. Gastrointestinal effects: Serious gastrointestinal toxicity such as bleeding, ulceration, and perforation with or without alarm symptoms may occur at any moment of the therapy. The physician should inform the patient about serious toxicity signs and symptoms and what to do in these cases. Liver effects: Alterations of the function tests may occur during Diclofenac treatment. These alterations may progress, remain stable, or be transitory with the continuous treatment. TGP periodical monitoring is recommended for the follow-up. Severe liver reactions, including liver necrosis, jaundice, and fulminating hepatitis, have been exceptionally described. Hydrosaline retention and edemas: It should be used carefully in patients with history of cardiac failure, hypertension, or other conditions favoring the hydric retention. Hematological effects: In some case, anemia, probably due to hydric retention, gastrointestinal losses, or erythropoiesis effects have been observed. In patients with long-term treatment with Diclofenac it is recommended that the hematocrit and hemoglobin be measured periodically. Renal effects: In patients treated with NSAIDs, isolated cases of papillar necrosis and interstitial nephritis have been described. A second form of renal toxicity, generally associated to NSAIDs, is observed in patients with conditions causing decreased blood volume or renal flow where the prostaglandins have a primordial role in maintaining the renal perfusion. In these patients the administration of these drugs may cause acute renal failure. Treatment suspension, in all cases, causes the generally complete recovery of the renal function to pre-treatment levels. Since Diclofenac metabolites are mainly eliminated through the kidney, the patients with renal failure should be controlled closer than those with normal renal function. Porphyria: The use of this product should be avoided in patients with liver porphyria. Aseptic meningitis: NSAIDs generally may trigger, rarely, aseptic meningitis with fever and coma especially in patients with history of erytematous lupus and other connective tissue diseases. Previous asthma: Diclofenac should not be administered to patients with history of bronchospasm triggered by aspirin. It should be taken into account that up to a 10% of the asthmatic patients may have asthma sensitive to aspirin. Other precaution: Blurred vision, decreased visual acuity, chromatic vision alteration and scotomas occurrences. In case these symptoms occur, the treatment should be stopped and the patient should undergo an ophthalmologic examination. Pediatric use: The product safety and efficacy have not been established. Carcinogenesis, mutagenesis and impairment of fertility: In several animal studies this kind of effects has not been described. Aspirin: The concomitant administration of aspirin and Diclofenac causes displacement of the latter of its binding sites producing low plasma concentrations and decreased peak plasma levels. Anticoagulants: Although studies have not shown interaction between Diclofenac and oral anticoagulants, like warfarin, their concomitant administration should be performed with caution due to the interactions described for other NSAI drugs. Diclofenac therapy alters the platelet function and the prostaglandin role in the hemostasia, so the concomitant administration of these drugs and aspirin requires a carefully followed up of the patient. Digoxine, methrotexate, cyclosporine: Diclofenac treatment may increase the digoxine and methrotexate plasma concentrations and the cyclosporine nephrotoxicity. Lithium: In patients treated with Diclofenac and lithium, lithium plasma concentrations may be increased. Therefore, development of the lithium toxicity should be controlled. Oral antidiabetic agent: Changes in the effect of insulin or Oral antidiabetic agent have been reported in the concomitant treatment with Diclofenac. Hypoglycemia and hyperglycemia have been detected. Diuretics: Diclofenac may decrease the diuretics activity. The concomitant administration of Diclofenac and potassium sparing duretics may increase the plasma levels of this last ion. Drug-drug interactions and laboratory tests: Diclofenac increases the platelet aggregation time but it does not affect the bleeding time, thrombin time, plasma fibrinogen or the levels of V, VII and XII factor. Statistically significant changes have been observed in the prothrombin time and thromboplastin partial time in healthy volunteers. These changes probably have not clinical significance. Pregnancy: Difen Flex should not be administered during pregnancy, especially in the last trimester, due to the risk of arterious duct premature closure. Lactation: It should not be administer either during nursing due to the potential risk of adverse events in the infant. Gastrointestinal tract: Diarrhea, nausea, constipation, meteorism, liver tests abnormalities, peptic ulcer with or without hemorrhage or perforation, erosive gastritis. Liver necrosis, jaundice, hepatorenal syndrome. CNS: Somnolence, depression, anxiety, irritability, aseptic meningitis, seizures. Skin: Rash, pruritus, urticaria, angioederma, Stevens-Johnson syndrome. Sense organs: Tinnitus, blurred vision, scotomas, tastes disorders. Cardiovascular: Hypertension, congestive cardiac failure. Hematological effects: Anemia, leucopenia, thrombocitopenia. Kidney effects: Olyguria, interstitial nephritis, papillar necrosis, acute renal failure. Respiratory system: Epistaxis, asthma, laryngeal edema. CNS: Dizziness and falls, muscular hypotonia, myasthenia, visual accommodation disorders, hallucinations, acathisia. One IM injection, twice a day. Prepare 1 hour before use. Acute overdosage symptoms include headache, psychomotor agitation, muscular spasm, seizures, epigastric pain, nauseas, vomits, hematemesis, diarrhea, gastroduodenal ulcer, liver function disorders and olyguria. Keep in a cool and dry place, preferably between 15° and 30°C.